Compare prices from several car hire companies in Barcelona and find the best price for car rental. Our prices always include unlimited mileage and insurance. 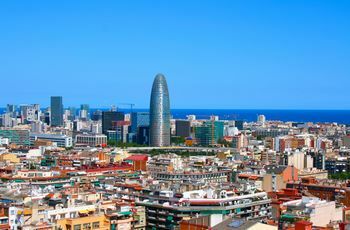 Barcelona is located on the northern east coast, bordering the Mediterranean Sea. This is the second largest city in the country with a population of more than 1 600 000 (2009). Barcelona is famous for the beautiful old city situated on the popular and wide streets, las Ramblas. In the old town you can wander through narrow alleys and visit the historic churches such as Santa María del Mar. The probably most famous church in town is the magnificent Templo de la Sagrada Familia from 1884. In addition, you can visit museums with exhibits of both Pablo Picasso and Salvador Dalí. Barcelona Airport is located in the town of El Prat de Llobregat.The airport is to find some. 10 km outside of Barcelona and is the second largest in Spain.